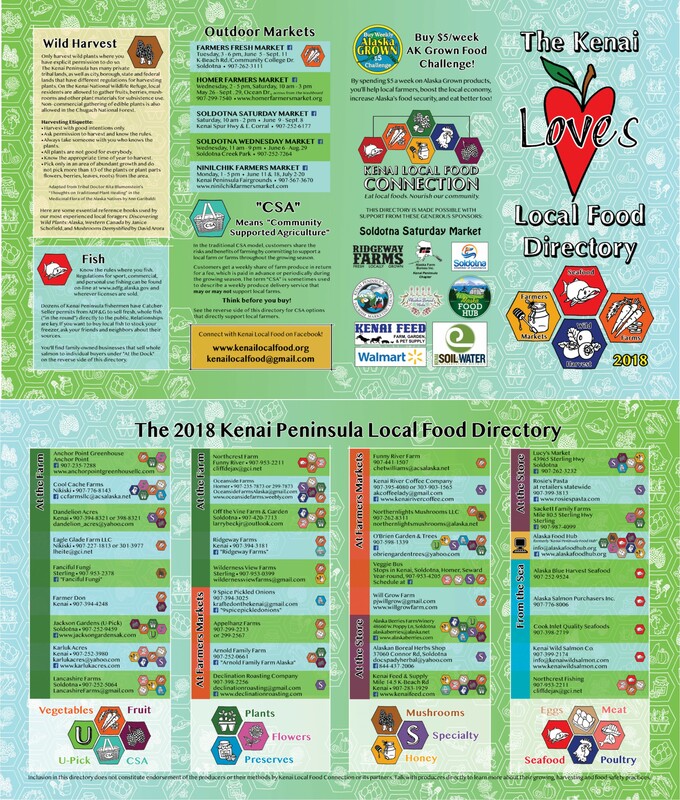 The Kenai Loves Local Food Directory is a project of Kenai Local Food Connection and Kenai Soil & Water Conservation District. 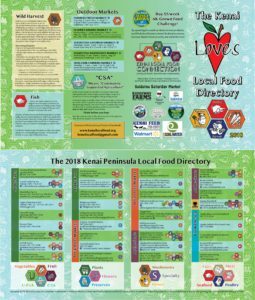 Since 2011, the Kenai Loves Local Food Directory has been the go-to resource for visitors, newcomers and long-time residents looking for local food of all kinds. Wherever the directory is displayed, the eye-catching design and compact format make a statement that our community loves local food and that the community of local food providers like you is growing. We distribute the directory widely at locations and events throughout the Peninsula with help from the visitor industry, Chambers of Commerce, libraries, health care organizations and participating businesses like yours. Advertising your business in the directory is not only a way to reach new customers. It’s also a way to encourage community support for a thriving local food sector. Step 1) Click HERE to provide information for your listing by MARCH 1. Please get in touch if you have questions: kenaiswcd@gmail.com or (907) 283-8732 x 5.